The Dunvegan was a three masted barque of 819 tons built in New Brunswick. It was on its way from Barry Dock in Cardiff to New Orleans with coal and general cargo. In January 1898 the ship went off course in a dense fog and crashed into rocks beneath the cliffs at Ballymacart Lower, Old Parish. The Nugent family who lived nearby went to assist the stricken crew. Mr. Nugent climbed down the cliff with a rope and eventually the captain and crew were all rescued. The captain gave the Nugent family the ship's clock as a thank you. Mr. Fuge of Glencorrin House, Ardmore. 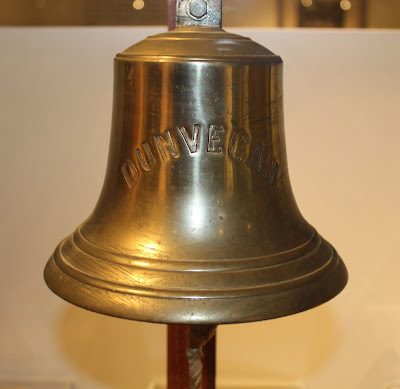 The bell was donated to the museum by the Miller family originally of Main Street, Dungarvan. For further details see John Young's 'A Maritime & General History of Dungarvan 1690-1978'.